What could be better than fresh, sweet carrots, just pulled from the earth and waiting to be eaten? Well, until recently, my son would have said that pretty much anything was better than carrots, in any form whatsoever. Given that he’s liked broccoli, watercress, and green beans practically from birth, his distaste for carrots seemed irrational. It was an earth-shaking revelation. And after they’d picked me up off the floor, I asked our waiter how the carrots had been cooked. They were indeed great carrots – sublime carrots, in fact – and I expected that exotic things had been done to them in order to make them taste so good. Of course I went home and tried to duplicate the results. Like most things, it was pretty easy once I figured out how to manage the variables. So here is the recipe I eventually ended up with. The Milford Bistro does it with whole carrots that are split down the middle, but I find it easier to control the results with carrots in slices. Slice carrots, not too thinly, and place in a pot of boiling water. Bring water back to a boil. 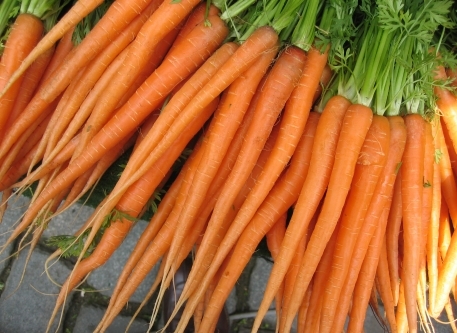 Boil for two minutes, then drain and rinse carrots thoroughly with cold water to cool them off. Drain again, thoroughly. Heat a frying pan on high heat. Add a bunch of butter and melt it. Toss the carrots in, add salt and pepper to taste, and fry until carrots look like they’ve been fried in butter. (Yes, I know that sounds both recursive and stupid, but I’m not sure how else to describe it! They get sort of golden on the outside, and they look… fried.) Stick them in a dish and serve them to your friends, your family, and your carrot-hating son. Eat a lot of them yourself. They’re really good. You can also add brown sugar to this recipe. While not exactly healthy, neither is better. I’d argue that butter is healthier than most other things you can fry carrots in, since it hasn’t been denatured with chemicals. But that’s another debate! 🙂 I’ll bet brown sugar tastes good with this, and I imagine it would also be nice with a little maple syrup. I am glad you saw that I meant butter and not better. Darn mobile devises are tough on my eyes…. No argument on chemicals. I am on your side. Our house kitchen is as natural as we can get it. Know what you mean, both about mobile devices, and about kitchens – the less freaky unnatural stuff I eat, the better I feel. I really enjoy your blog, by the way! Seriously though, has the offspring ever had glazed carrots? Ooooo! Maple AND bacon! mmmmmmmmmmm!!!! I have to come back up north soon! I’ll be there in May! Details in e-mail when I have it figured out. This entry was posted on March 15, 2013 by thinkreadcook and tagged butter, carrots, cooking, easy, food, Ontario, recipe, recipes, vegetables.